I have been musing about the Video CV for about a fortnight now. 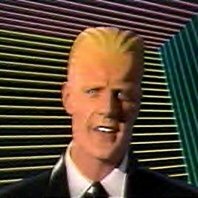 Having just watched Max Headroom on YouTube it struck me that we have been living in the world of Max for quite a while. Yet it seemed incomplete, a vision only partly rendered? I’m going to make a bold(ish) prediction that the uptake in requirement for a Video CV is on a definite upward trend, gaining enough momentum that along with the Video Interview everyone in a position of value needs to ready themselves for the camera and evolution of Job Applications. Last night at the Oscars, Daniel Day-Lewis picked up the 2013 Oscar Best Actor Award for Lincoln and I think we need to start taking some notes on how to win something elusive, three times by representing ourselves as something we are not! But what has made me consider this is now an option? Cost. It’s a simple balance sheet issue; save money and get the candidates to submit a Video CV. An agency can then sift through the responses and create a shortlist with client access. Saves time, resources and controls how long each person can talk for ie if they ramble on (4 page CV or longer) the recruiter can just consign them to the also rans and with no emotional attachment. Quite a few candidates will baulk at the idea (Last of the Baby Boomers, Generation X and Luddites) but Generation Y will be more comfortable with a Video CV, but may lack the gravitas, required experience or both to convince the viewer and this will follow a similar pattern to the current predicament they face with a traditional CV. What was once a simple idea that lacked the technology and infrastructure to make it possible is now a cost saving, functioning and easily accessible way to condense a process. ← Video Interview, is the UK ready?